Jesus also added a caveat in Matt. 24:24; “For false messiahs and false prophets will appear and perform great signs and wonders to deceive, if possible, even the elect”. Then; how do we differentiate good Prophets from false Prophets? Jesus answered in Matt. 7:16 "You will know them by their fruits”. In other words, from the fruit we shall know the tree that produced it. And Jesus being the tree of Christianity, every fruit that this tree bears must be the word of God. Therefore, whosoever that doesn’t preach in accordance with the dictates of the tree (Jesus) even though he/she performed signs and wonders is a false prophet. Unfortunately, you may no longer know a fruit by the tree that produced it. Science has advanced. In agriculture, there is a term known as budding. This is a process where a different tree is grafted onto the stem of another tree. The appended tree will produce a fruit that is not of its host stem. For example, if an orange is budded onto a mango stem; both will grow to produce an orange fruit. And thus; you may not judge this particular tree by its fruit. But I don’t believe that Jesus as the tree of Christianity envisaged that it will be budded to produce a different fruit other than the word of God. Therefore, a practice outside the behaviour and teachings of Jesus is a sign of false prophecy. When Jesus was on earth, he performed miracles and healed people for free. He never sold holy water to his congregations nor collected tithe from them. He even fed five thousand people with five loaves of bread and two fish during a crusade, which was called Sermon on the Mount. Jesus didn’t have a house, wife or children. He accepted the things of the spirit such as long-suffering, goodness, meekness, faith, etc. He rejected the things of the flesh like adultery, wealth, etc. He was poor in flesh but rich in spirit. Thus, in order to be considered a Christian/Prophet/Pastor, you must not bud the tree of Christianity. 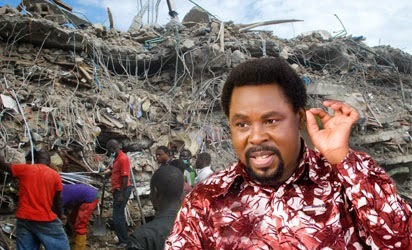 However, there is a church in Lagos, Nigeria known as Synagogue Church of All Nations (Synagogue), founded by T.B Joshua (TB). One of the tenets of this church is miracle and so people of all nations flock to the church to receive their miracles. Since I have been hearing about TB, Synagogue and his miracles there isn't a human who could point out a person who received a miracle from the ‘Prophet’ except the magic we see on his Emmanuel TV. Initially, many thought that TB healed people with satanic powers. I don’t believe he has any kind of spiritual power in the first place. All his purported miracles are untrue until proven otherwise. If his miracles are real, let him present a verifiable beneficiary of his miracle. The person must be a human and have family members, village/city neighbours that can confirm the illness that TB cured him. The burden of proof is on TB Joshua. As far as I am concerned TB is just a businessman making money in the name God. His synagogue is a business concern, which is setup for profit making. He sells holy water for between N5000 and N10000 per bottle depending on your status. He took from the needy instead of giving to the needy as the bible commanded. He fits well into the characteristics of a false prophet. He is at variance with the doctrine Jesus upheld. On Friday, 12th of September, a guesthouse located within the Synagogue church premises collapsed completely to the ground. Few days later, ‘Prophet’ TB Joshua presented to Nigerians and the world a video clip showing a plane hovering over the six floor building that he claimed caused the building to collapse. Hence, he alluded it to the handiwork of antichrist. TB is so engrossed in deception that he believes every Nigerian is as gullible as those that attend his church. The building that collapsed at the Synagogue was previously a cafeteria that served pilgrims. Later it was converted into a four story guest house. Each pilgrim is charged N50,000 per night to stay at the guest house. There is also a VIP guest house that is meant for government people and other countries’ presidents. They pay N100,000 per night. As clientele (pilgrims) increased so is the need for more accommodation. TB decided to add two more floors on top of the converted four storey building, which resulted in the collapse of the entire structure. In fact, it was reported that TB’s servants at the Synagogue obstructed emergency personnel from doing their job. I guess they were more interested in protecting the image of their master than saving the lives under the rubbles. There may have been a physical ‘fall’ of a building at the Synagogue; it could also be interpreted as a spiritual sign of the fall of the Synagogue Church of all nations. TB Joshua is used to showing people signs and wonders. He is beclouded by greed and wealth that he will never ponder if this mishap was a sign from God that enough is enough. Let me remind TB to read Matt. 21:12-13 where Jesus showed his anger to those who turned his father’s house of prayer into a profit making venue. Moreover, Matthew 12:31 stated “…all manner of sin and blasphemy shall be forgiven unto men: but the blasphemy against the Holy Ghost shall not be forgiven unto men”. This is very simple. If you commit adultery, kill, steal, etc. ; you will be forgiven. But you will never be forgiven if you blaspheme against God even if you ask for forgiveness. And so; I have often asked; why would a man go to the extent of committing a sin that he will never be forgiven.